Use TB2QA76 to reference this item. Speeding, inattention, inexperience, fatigue, drugs and alcohol and illegal manoeuvres are given reasons for causing accidents. YOU have the power to do something to control each of these factors. Some of the catch phrases that have been used to promote safe driving and riding: Rolling stops kill, driving and riding responsible helps save lives! Respect those around you, watch for all users of the road! Stop driving distracted, look for bikes! Bikes have every right a car does, please share the road! Come and join us at “Todies Wild Ride” in the geocoin discussions, read, write and learn "watching for bike safety". Will place it in a cache in Gothenburg as soon as possible. This one is going to another town. 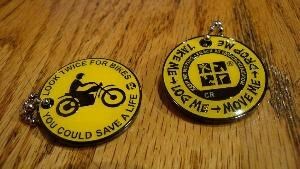 Todie's Wild Ride: Look Twice for Bikes, You could Save a Life Geocoin (NL6) was transferred from Solan109 to user Sivota. To all geocachers who retrieve and drop this geocoin. I wish you have a sunny trail and a save journey. Please take the message this coin is spreading serious.